One of the first lessons new drivers learn is which pedal is for gas and which one is to brake. Nevertheless, pedal error accidents are more common than you might expect. 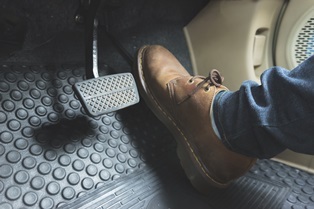 According to the National Highway Transportation Safety Administration (NHTSA), there are an estimated 16,000 accidents resulting from pedal errors each year. This equates to about 44 accidents per day happening because the driver confused the gas and brake. If you've been injured in this type of accident, you can file a personal injury claim against the at-fault driver to receive reimbursement for your expenses. The Louisiana statute of limitations typically gives you one year from the date of the accident to do this. What Causes Pedal Error Accidents? Pedal accidents are most likely to be the fault of drivers under the age of 20 or over the age of 65. Younger drivers may make the mistake of confusing the pedals when they are nervous or driving in an unfamiliar area. Distracted driving behaviors, such as texting while driving, eating while driving, listening to music, or talking to passengers, might also contribute to this mistake. Drivers over the age of 65 are likely to confuse the pedals due to age-related cognitive decline. They may also be losing feeling in their extremities, which can prevent them from correcting the error in time to avoid an accident. It is unclear why, but older female drivers are more likely to make this type of mistake than their male counterparts. Some drivers involved in this type of accident may have a history of struggling to drive safely due to their age. In both age groups, drivers who wear flip flops, high heels, heavy boots, or thick soled shoes are more likely to make pedal errors than those who choose lightweight, flat soled shoes. Sharing a vehicle can also increase the risk of pedal error accidents, if the driver doesn't take the time to adjust the seat and mirrors, so he can comfortably see the road and reach the pedals. Pedal errors can occur at any time. However, these accidents are more common in low speed situations requiring frequent stopping and braking. Pedal error accidents most often occur while driving through parking lots or in stop-and-go traffic such as a road with crosswalks used by pedestrians. Accidents may also happen pulling out of private driveways in residential neighborhoods, putting pedestrians using the sidewalk at risk. Although pedestrians are responsible for taking reasonable precautions to ensure their safety, most are not expecting drivers to make this type of obvious mistake. As a result, they generally don't have enough time to take action to avoid being injured. Children are at an even higher risk of injury, since they trust adults to keep them safe and are less visible to drivers due to their smaller size. Since pedestrians have no protection from the force of a vehicle's impact, even low speed accidents can result in broken bones, internal bleeding, head trauma, and other serious injuries. To receive the funds you need to recover from this type of accident, you can file a personal injury claim.